Cottam No1 or Cottam Old pit. SK 465771. J.& G. Wells and then Appleby & Company, Eckington Coal & Iron Company. 1798-1886. Cottam No2 or Cottam New pit. 1826-1892. Appleby & Co, Eckington Coal & Iron Company. Colliery and Brickyard 1840. Mining Top Hard and High Hazels seams from at least four shafts. Site was served by a static steam engine at SK 46030 76828 the remains of which are still there. A comment from me. 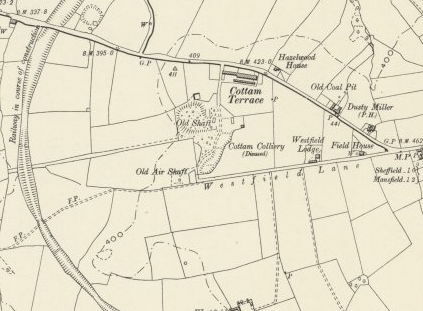 Cottam railway is pretty level from looking at the site, seems to follow the contours well from Cottam 1 to Renishaw Ironworks. The run up to number two was a different matter it crosses the contours. Although the coal was running downhill materials either came up the grade or by road from Barlborough road and downhill. The no2 tramway later linked to the LD&ECR. There is a length of light gauge rail in the wood at the bottom of the incline somewhere. I still wouldn't like to be stood in front of a full tub coming down the incline though. Derbyshire Times 2nd October 1880. On Wednesday morning an accident, that resulted fatally, occurred at the Cottam Colliery Barlborough when a youth named Jennings was crushed when a large amount of bind fell on him crushing him severely. Such was the quantity of bind that fell a pony was also killed. At Messrs Appleby and Company’s Cottam Colliery a slight explosion of gas occurred on Thursday morning when two men were burnt. A shocking accident, which terminated fatally, occurred at noon on Wednesday to Mr. Hazelby enginewright at the colliery, which is at Barlborough and belonging to the Renishaw Iron Company. The coal from the colliery is conveyed part of the way to Renishaw Iron Works in trucks drawn up an incline. Mr. Hazleby was proceeding from his office to the colliery up the incline when he met a loaded train. He stepped out of the way apparently forgetting some empty trucks were coming up on the other line. These dashed against him resulting in his skull being fractured. On Monday all the men in connection with the above colliery employed by Messrs Appleby and Company Renishaw Iron Works left their employment owing to the coal having being got belonging to the Company.